This is a basic water heater for smaller GPM needs. 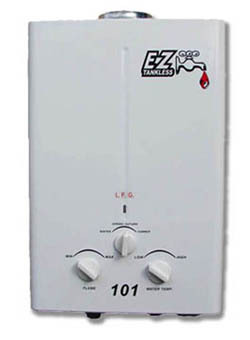 This 101 model makes hot water right now! Comes with a shower set. Basic easy to operate and understand controls make this the perfect heater for the summer lake cabin, the pool house shower, campsite, pole barn, farm, work shed, and garage. Anywhere that a user needs on demand instant hot water. This unit is not designed to be mounted inside a residential dwelling. The 101 works great in any well ventilated area, under the lean-to or car-port, or just hanging on a fence post or tree. Our 101 LP (Propane-LPG) model is very popular with outdoorspersons nationwide. This little unit will work fine with a small barbeque type LP tank and a garden hose. We have users who have connected to gravity feed water supplies and pumps taking water directly from mountain streams. These have been used at altitudes exceeding 8,000 feet. Pilotless ignition supplied by two long lasting "D" cell batteries. Dimensions 18" x 12" x 5"
Packaging Size 24" x 15" x 8"